Some of the most successful dishes are made of very simple combinations of ingredients and techniques. 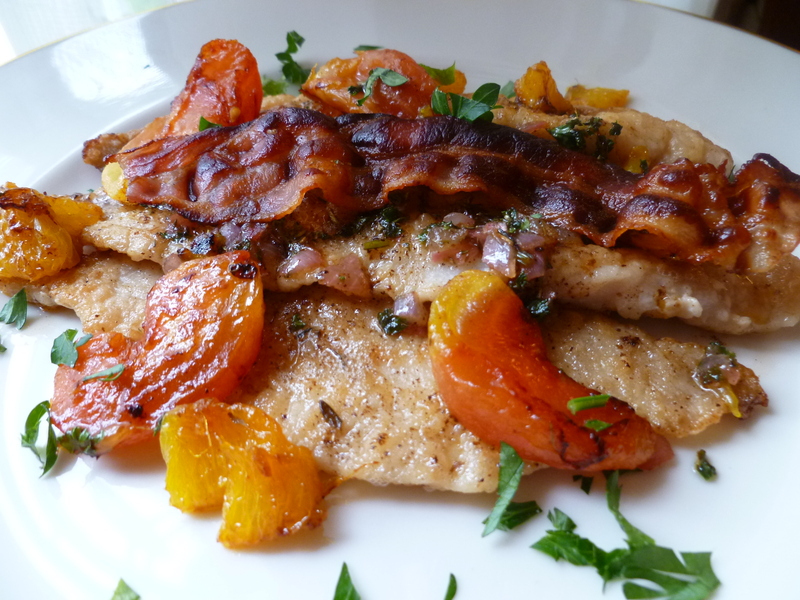 Filet of Fried Sole with Oranges and fresh Tomatoes is such a dish–adapted from a recipe in Dione Lucas’s collection from the Cordon Bleu Cooking School. Mrs. Lucas was a deservedly famous teacher of French cooking in America whose written views on the topic are as enjoyable to read as her recipes are to make and eat. To her mind, cooking good food was an essential part of good living. “[It] cannot be relegated to the same category as dishwashing or making beds,” she said in the introduction to her first book, The Cordon Bleu Cookbook (1947), “Preparation of food requires, time, skill and patience, and results mean the difference between mere eating to exist and the satisfaction derived from one of the major pleasures of life.” Certainly, this preparation of sole produces pleasurable results. The fish Mrs. Lucas’s recipe calls for is one in the peculiar family of flatfish who begins life looking like any other fish until, one day, one eye migrates to join the other and he flops over onto his side, both eyes up, assuming his permanent flat, goggle-eyed form. In the United States, unless you purchase imported frozen sole, the flatfish sold under that name is probably going to be flounder. 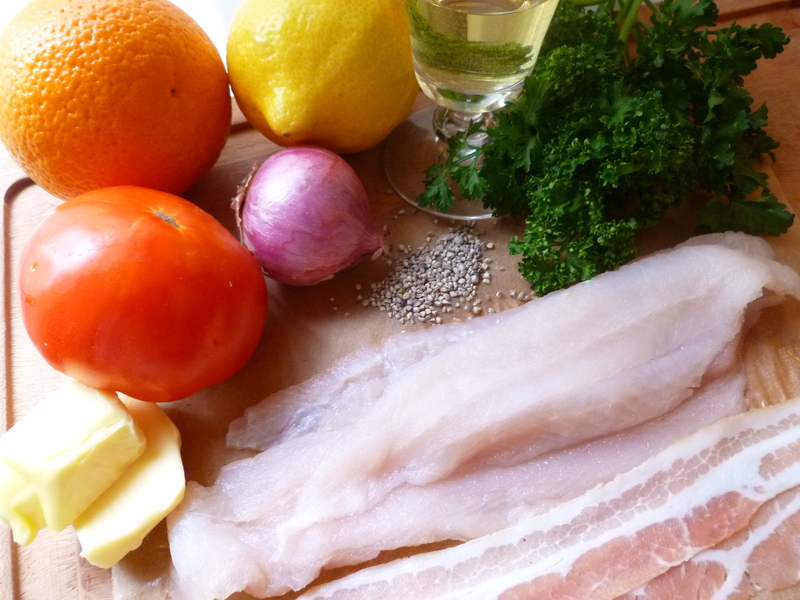 Lemon sole, for example, is actually a flounder. If you can get it, true sole is better. But flounder, too, is a flatfish of fine texture and mild, sweet flavour, and will substitute for sole very well. 1. Fry the slices of bacon crisp and brown and set them aside. 2. Skin and seed the tomatoes: place them in boiling water for a minute, then drain them in a colander and pour cold water over them. The skin will peel off easily. Cut the tomatoes in six or eight sections and discard the seeds. 4. Check the filets for bones by running a finger down their length. Tweezers are useful for pulling out any strays: Happily, saltwater fish tend to have thicker and fewer bones than freshwater ones. 5. In the smaller pan, melt 1 tablespoon of butter, add the tomato slices and orange sections and toss them around in the hot butter for a minute or two. 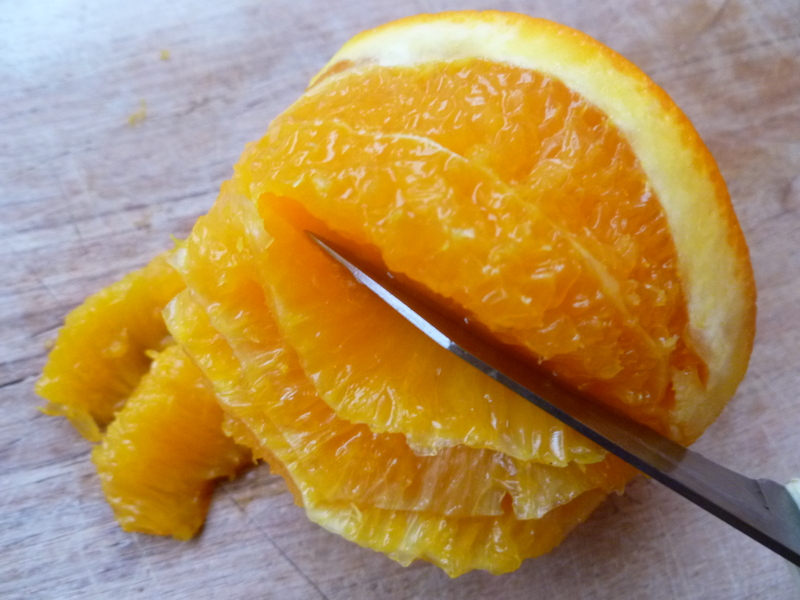 The juice from the oranges will just begin to caramelize. 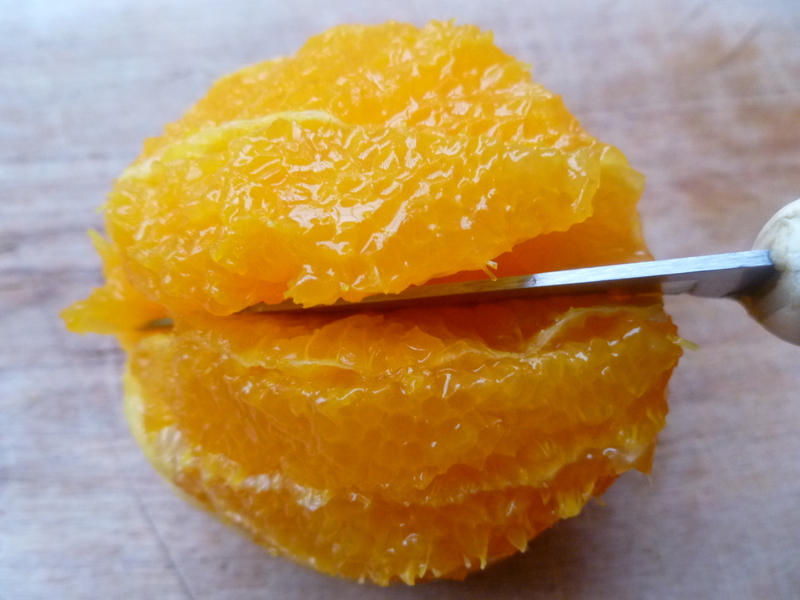 Put the pan of tomatoes and oranges aside, covered lightly with a cotton towel or a piece of aluminum foil. 6. Dust the filets lightly with flour and sprinkle them with a few grinds of fresh white pepper and salt. Add 4 Tablespoons of butter to the larger pan and, when it begins to foam, put in half the filets. Fry them until they are golden, turning them once. (They will be ready in a few minutes.) Transfer them to a pan or platter and lightly cover them with a dishtowel or piece of foil. Add 4 more Tablespoons of butter and fry the remaining filets. 7. To the pan used for frying the filets, add 4 Tablespoons of butter. When it foams, add the lemon juice, wine, shallot, garlic and parsley and thyme. Cook the sauce for a minute, stirring it with a whisk. 8. 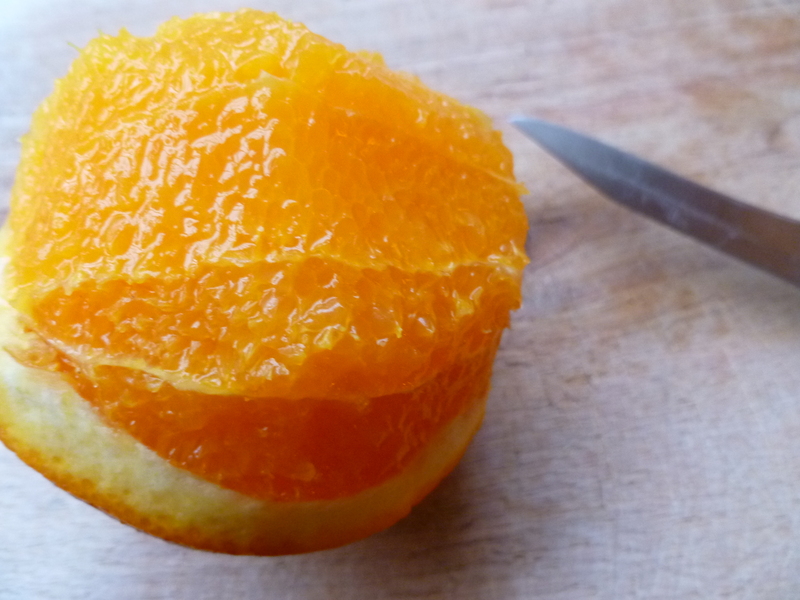 Reheat the tomatoes and orange segments briefly. 9. Place a whole filet on each plate and scatter some of the tomatoes and orange segments around each piece. 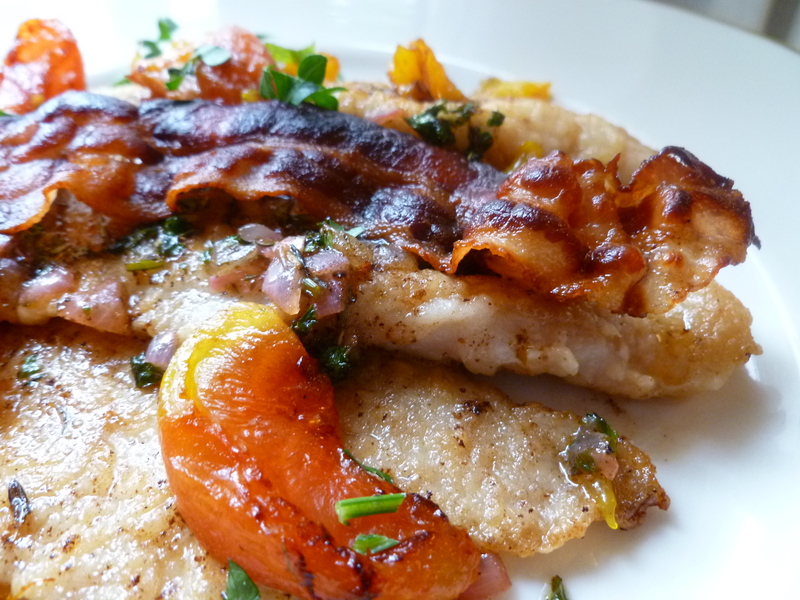 Pour a little sauce over the fish and place a slice of bacon on each one. Sprinkling each plate with some finely chopped parsley looks nice. 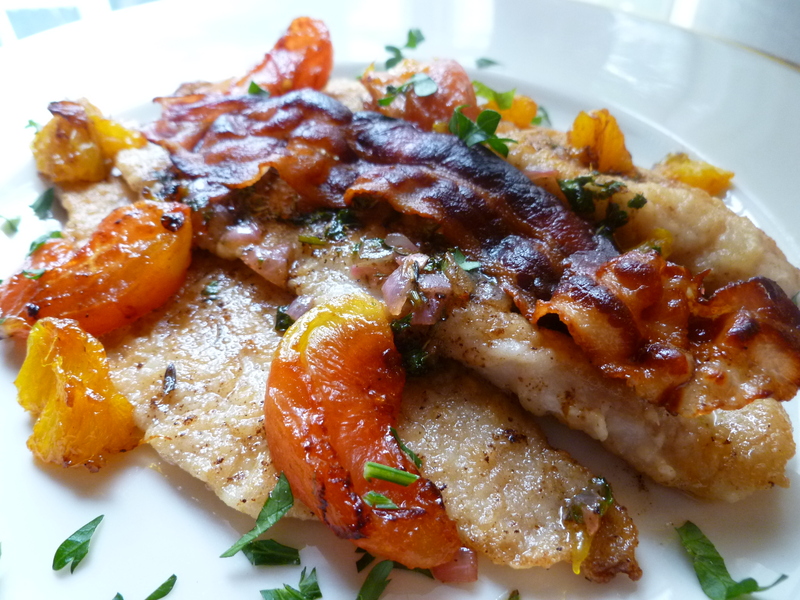 A Note: Fried Filet of Sole with Oranges and Fresh Tomatoes is the Main Course in the Lunch Menu: Simply Delicious Combinations.